The pants were mostly finished last weekend but there were a few issues that needed to be attended before anyone could see them. The pattern modifications I made while great in my sheet muslins were not working out for the thick felt. Mostly I had too much fabric in the crotch area which while comfortable, was very strange looking. Also the button ended up being too far inside the waist band and the waist itself was a little loose. To fix these issues I ripped out the entire crotch and cut off the excess fabric, opened the center back seam and resewed it smaller, and cut the button hole bigger. Oh yeah, the first buttonhole was totally mangled so I pulled out all that and hand wrapped some stitches around the hole. It's felt so these stitches are mostly decorative anyway since it's not unraveling. conservative use of bright orange top stitching thread, I didn't want these to look like a joke when I was done. The raw edges turned out great and being felt are actually hard to notice. I used them on the cargo pockets, side seam pocket facing, leg opening, inside waist band, belt loops, inside welt pockets, all seam allowances. Speaking seam allowances. The wool doesn't really take a crease which means the seam allowances sort of flop around inside the pants. I have three options: Leave them as they are, trim them short which might loose seam integrity, or the most correct.. to hand stitch them down similar to blind stitching a hem. I might get around to this if I'm really bored in the next week, we'll see. 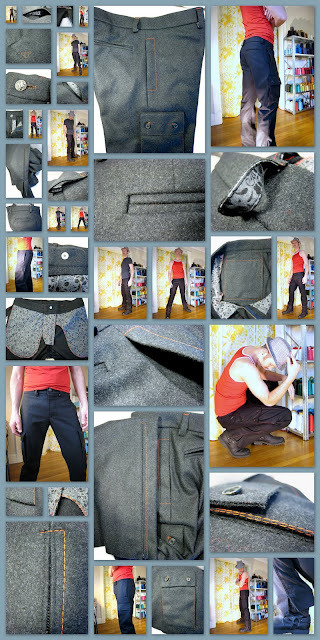 I reduced the size of the cargo pockets even more since I sewed the pattern the first time. The slim pocket just looks so much better. I also included a facing on the front side seam pockets this time and I was sure to turn my pocket bag fabric so no matter if you were looking inside the pants or inside the pocket the right side faced you. I'm sure I'm not the first to do this but I felt rather crafty thinking of this. I also choose to overcast the raw pocket bag edge instead of using the serger since I feel it makes things look more handcrafted. I also prefer this type of treatment for pocket bag finishing because it's flatter and helps avoid seeing the bag outline on the outside of the pants. I almost forgot to mention the welt pockets. As suggested by a reader I tried out Kathleen Fasanella's welt pocket tutorial over at her blog fashion-incubator.com. I will admit, I had to read it quite a few times and go back and forth to really understand what I was doing but WOW, that technique makes a easy and beautiful welt pocket. I might ever call it fool proof but don't want to offend anyone who can't make it work. Considering this is my second attempt at a welt pocket and first using this system I've basically mastered the technique. Just another reason to love the work Kathleen is doing over there. Top stitching in orange is very cool and really pops on the dark gray I used just enough to give these pants some youth without trying to hard to be trendy. The pants are very heavy and the fabric doesn't fall away from your body but rather clings and bunches. I think next time I come across some wool felt I'll make jeans from it instead of slacks. The top stitching looks very professional and your pockets are perfect (I had to read Kathleen's tutorial about 8 times before I got it, but it does make sense - it's all about the jig). By the way, when I was in college I was hanging out in the dorm lounge one day with a bunch of the guys who lived down the hall and I was wearing a pair of gray velvet jeans. One of them patted my leg and asked "are those pants felt?" and I stupidly started to say "no, they're velvet, dumbass". And then he interjected with "they are now" and wandered off, and I felt stupid, because I honestly thought he was interested in my velvet pants, and because he was a guy he wouldn't know the difference between felt and velvet. They're fantastic! Your topstitching is immaculate. And those pockets - mon dieu! Great job. Those lined belt loops are tremendous! Your workmanship is amazing! I could see this type of fabric for jeans. I love the personal touches/numerous details that make these pants *yours. * And I love the thrifty use of materials you already have. Bravo for that! The welt pocket is divine. I find KF's tutorials to be difficult to understand. Good for you for sticking it out! Orange top stitching on gray pants? Sure, why not?! I just wish it was a little thicker thread. I'm gonna disagree on the choice of fly button. It has a Tyrolean vibe that doesn't work with the other buttons. I like to see all buttons in the same garment belong to the same button family. These guys aren't even distant cousins. The hand finished buttonhole is something else I would change up. The way you have it now, it looks, how shall I say?, rather relaxed in its execution. If you're gonna do a buttonhole by hand, might as well go all out. Use a blanket stitch and do it all up. (Hand sewing can be as therapeutic as cleaning a sewing machine.) It will be a great way to teach yourself blanket stitch, which you could then apply to collar edges or cuffs (or a blanket edge, of course). There are old books that will teach you how to do this. There's also that site (forget the name) that has uploaded pages from old sewing books. Have you seen David Coffin's new pants book? It is incredible. You would get a lot of use out of it. Check it out. I know you're thrifty and all, but the book will totally be worth it for you. As Kerry mentioned, there's an old Vaudvillian joke: Is that that felt? [touches item] Well it is now! It's usually only done by elderly people. What! My buttons have to match, I've never even considered such a thing. I mean it didn't even cross my mind! I even considered using different buttons all across the project. Now you've planted the seed for sure.... shhhh... don't tell but my leg cuff zippers don't actually match either. I do have Coffin's pants book and I really enjoyed it. It's where I got the idea to reduce bulk whenever possible. In fact! I did a YouTube video review of his book and David Coffin himself left a comment. I also agree on the waist buttonhole. It looks a little too handcrafted but I was so lazy about learning how to blanket stitch. I suppose I'll do it...... now that I've been officially called out. You know what, I really like constructive criticism... I've found that I can do pretty much anything as far as sewing goes but often I forget or don't know to do certain things. Reminders are always welcome. The thing that I really love about sewing is that I don't think I can ever know everything. I will never get bored because there's always something new to learn. I've always said, "I'm a constructionist not a designer. Just tell me exactly what you want and I'll make it happen." Wow, your welt pockets are fabulous. I'll have to check out Kathleen's tutorial. Your pants look amazing, Brian. I am pleasantly surprised by the orange pop, too. Very well done! They look amazing! I love the orange topstitching and your lining fabric. These are beautifully-done. Amazing work. When I next make some pants I am going to pore over your slideshow. And am I the only person to mention your sweet 'stache? Very handsome, good sir. Those pants are a work of art! All the choices along the way made them that. Awsome construction skills. Very nice pants!!! You always do such a great work!!! Nice Job!! Your pants look great.